Welcome! I am so glad you are considering taking part in writing your own daybook post and joining the community. I have created these guidelines, not to stress you, but rather to keep the daybook in tact. Since the daybook began in early 2008, there have been many copycats pop up...so I created this page with it's guidelines to help keep the daybook in it's original form. 1. Create your TSW Daybook using the prompts, as well as the original created graphic below. 2. Please include a link back to my blog using this link. This is a requirement and a kind gesture to me, as your hostess and to your readers. 3. 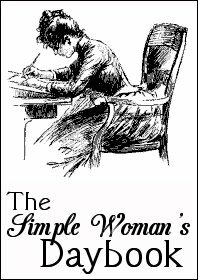 Copy the "permalink" ONLY from your "The Simple Woman's Daybook" post, not the link to the any other entry on your blog. PLEASE NOTE: Inappropriate links, links directly to things you sell (you are welcome to add those links IN your Daybook post), and Daybooks that do not follow the guidelines within this post will be removed at my discretion. This means re-wording, adding to the prompts, mixing someone else's link-up prompts to TSW Daybook and multiple linking in combination with TSW Daybook will be removed. I would truly like to keep the TSW Daybook, individually unique and in tact. Please and thank you for respecting my wishes ever so kindly. The Simple Woman's Daybook Edition is posted the first Monday of each month, but you are free to link-up as many times as you wish during that month. Also, below you will see prompts that are marked optional, these you are free to delete since they do not pertain to everyone. Just highlight, cut and paste into your blog post and add your thoughts as you wish. Enjoy the TSW Daybook as it brings you directly into your present moments.